Home » Other » St. Anne’s Community College getting ready to rock you! St. Anne’s Community College getting ready to rock you! St. Anne’s Community College, Killaloe is getting ready to rock you! 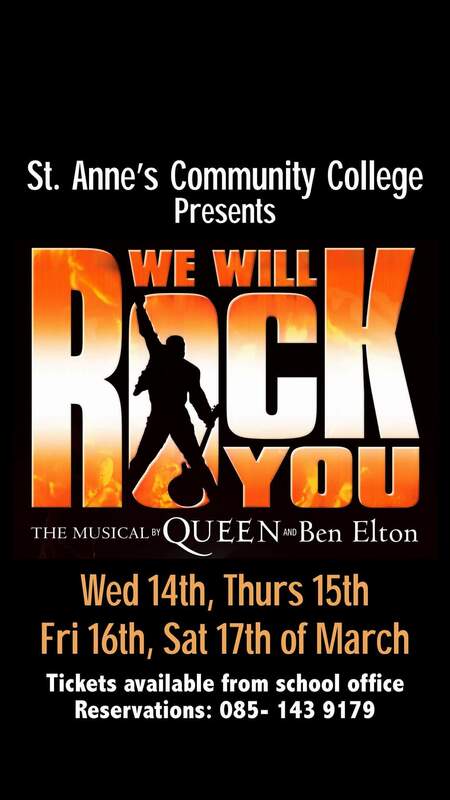 Over 100 students are busy rehearsing ahead of the school’s production of ‘We Will Rock You.’ The musical will take place over four nights from Wednesday 14th March with the finale on St. Patrick’s night, Saturday 17th March. This show is the latest in a long list of acclaimed productions held in the school over the last decade. It builds on the huge success of the school’s production of ‘Les Miserables’ in 2015 which culminated with the cast opening the show at the Bord Gáis Energy Student Theatre Awards in 2016 and making front page news on the Irish Independent. ‘We Will Rock You’ is tells the story of a dystopian future where technology has taken over and real music has been banned by the Killer Queen (Molly Fennessey). A band of Bohemian rebels led by Galileo (Kyle Collins) and Scaramouche (Jessica Doyle) are on a mission to save rock and roll for good. This show will appeal to all ages with Queen’s iconic music sure to have everyone rocking in their seats. Doors open at 7 p.m and the performance will begin at 7.30pm. For bookings call 085 143 9179. Don’t miss out on what promises to be a great night’s entertainment. Get ready to rock. By killaloeteacher in Other on March 1, 2018 .